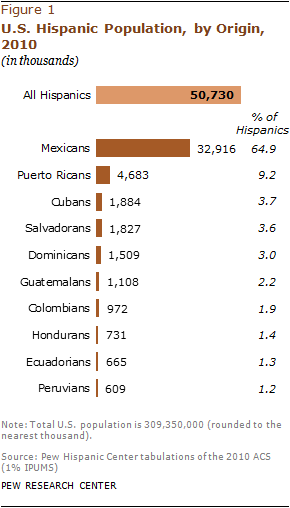 Overall, the 10 largest Hispanic origin groups—Mexicans, Puerto Ricans, Cubans, Salvadorans, Dominicans, Guatemalans, Colombians, Hondurans, Ecuadorians and Peruvians—make up 92% of the U.S. Hispanic population.2 Six Hispanic origin groups have populations greater than 1 million. Hispanic origin groups differ from each other in a number of ways. For instance, U.S. Hispanics of Mexican origin have the lowest median age, at 25 years, while Hispanics of Cuban origin have the highest median age, at 40 years. Colombians are the most likely to have a college degree (32%) while Salvadorans are the least likely (7%). Ecuadorians have the highest annual median household income ($50,000) while Dominicans have the lowest ($34,000). Half of Hondurans do not have health insurance—the highest share among Hispanic origin groups. By contrast, just 15% of Puerto Ricans do not have health insurance. Hispanic subgroups also differ in their states, regions and counties of geographic concentration. Mexicans, Salvadorans and Guatemalans are largely concentrated in western states, while Cubans, Colombians, Hondurans and Peruvians are largely concentrated in the South. The largest numbers of Puerto Ricans, Dominicans and Ecuadorians are in the Northeast. The nation’s Cuban population is the most concentrated. Nearly half (48%) live in one county—Miami-Dade County in Florida. Miami-Dade County is also home to the nation’s largest Colombian, Honduran and Peruvian communities. For Mexicans, Salvadorans and Guatemalans, Los Angeles County in California contains each group’s largest community. 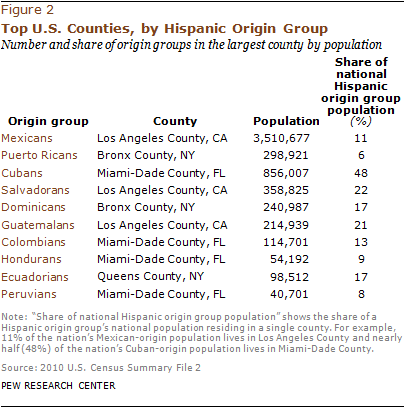 Los Angeles County alone contains 9% of the nation’s Hispanic population. Bronx County in New York contains the largest Puerto Rican and Dominican populations. And Queens County in New York contains the largest Ecuadorian population. This report also includes an analysis of changes in the characteristics of the 10 largest Hispanic origin groups from 2000 to 2010. During the decade, the foreign-born share of each major Hispanic origin group declined. Among all Hispanics, the share foreign born fell from 40% in 2000 to 37% in 2010. Meanwhile the share holding U.S. citizenship increased from 71% in 2000 to 74% in 2010. Among all foreign-born Hispanics, the share holding U.S. citizenship increased from 28% in 2000 to 29% in 2010. Hispanics have made gains in terms of their educational attainment during the decade. In each of the 10 groups, the share ages 25 and older with a college degree increased. Among all Hispanics, the share with a college degree increased from 10% in 2000 to 13% in 2010. Hispanic origin is based on self-described family ancestry or place of birth in response to a question on the Census Bureau’s American Community Survey. Ancestry is not necessarily the same as the place of birth of the respondent, nor is it indicative of immigrant or citizenship status. For example a U.S. citizen born in Los Angeles of Mexican immigrant parents or grandparents may (or may not) identify his or her Hispanic origin as Mexico. Likewise, some immigrants born in Mexico may identify another country as their origin depending on the place of birth of their ancestors. However, most Hispanic origin groups had lower median household incomes in 2010 than in 2000 (adjusted to 2010 dollars). Overall, median household income among Hispanics fell from $43,100 in 2000 to $40,000 in 2010—a decrease of 7%. And the share living in poverty increased two percentage points, from 23% in 2000 to 25% in 2010.3 Among all U.S. households, median household income (in 2010 dollars) fell from $54,200 in 2000 to $49,800 in 2010—a drop of $4,400 or 8%.4 The poverty rate for all Americans increased by three percentage points over the same period. Hispanics are also the nation’s largest immigrant group and one of its fastest growing populations. According to the Census Bureau, Hispanic population growth between 2000 and 2010 accounted for more than half of the nation’s population growth (Passel, Cohn and Lopez, 2011). Among the nation’s 40 million immigrants, nearly half (47%) are Hispanic (Pew Hispanic Center, 2012). 2011). Among the nation’s 40 million immigrants, nearly half (47%) are Hispanic (Pew Hispanic Center, 2012). This report compares the 10 largest Hispanic origin groups in the U.S. on several characteristics. In addition, accompanying this report are 10 statistical profiles—one for each Hispanic origin group. Each statistical profile describes the demographic, employment and income characteristics of a Hispanic origin population residing in the 50 states and the District of Columbia. The characteristics of an origin group are also compared with all Hispanics and the U.S. population overall. This report uses data from the 2010 American Community Survey (ACS), the 2010 U.S. Census and the 2000 U.S. Census (5% IPUMS). The accompanying Hispanic origin profiles use data from the 2010 ACS. This report examines the Hispanic population of the United States by its 10 largest origin groups. The data for this report are derived from the 2010 American Community Survey (1% IPUMS), which provides detailed geographic, demographic and economic characteristics for each group. The 2000 Census (5% IPUMS) provides data for comparisons in the summary. Accompanying this report are profiles of the 10 largest Hispanic origin groups—Mexicans, Puerto Ricans, Salvadorans, Cubans, Dominicans, Guatemalans, Colombians, Hondurans, Ecuadorians and Peruvians. Also accompanying this report is an interactive graphic ranking these groups on several characteristics. Seth Motel is a research assistant at the Pew Hispanic Center. Motel earned his B.A. in political science from Brown University. Eileen Patten is a research assistant at the Pew Hispanic Center. Patten earned her B.A. in sociology and English from the University of Michigan. The authors thank Paul Taylor for editorial guidance. Mark Lopez and Rakesh Kochhar provided comments. Antonio Rodriguez checked numbers in the report. Molly Rohal was the copy editor.